By early next year, alongside the sound of jets landing at the Midland International Airport, you might also hear sonic booms from space flights re-entering the earth’s atmosphere. This month, the private space company XCOR broke ground at the airport, where it plans to launch commercial space flights next year. Some hope this new industry will stabilize the region’s traditionally oil and gas-based boom and bust economy. The airport is still waiting to get the go-ahead from the FAA to launch those flights, but XCOR says despite some delays, it’s likely that will happen before a September 15th deadline. XCOR President Andrew Nelson says the groundbreaking ceremony the company held recently for its new research and development hangar is proof of just how confident XCOR is that the spaceport license will be approved. The hangar is where the company plans to finish building, and eventually to start launching, its “Lynx” spacecraft. It looks like a tiny space shuttle, and anyone who can afford the $95,000 ticket up will be able to take a tour of the heavens. But Jeff Greason, XCOR’s CEO, is quick to note that his company’s marketing these flights mainly to researchers, not just wealthy people, and according to him, certainly not to tourists. “We don’t call it tourism,” he says, adding that part of XCOR’s goal is to make these flights to space more affordable over time. It makes sense that he’d make that comparison. After all, this is a brand new industry coming to a region that’s been dominated by oil and gas for decades. 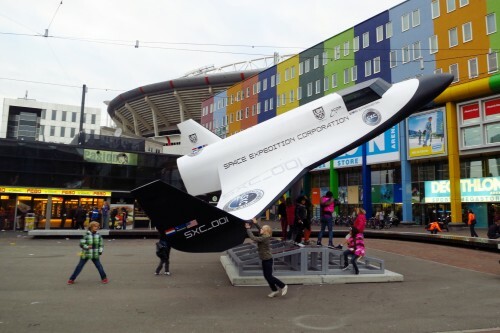 The company and the city say XCOR’s presence could help diversify and stabilize an economy that’s all-too-familiar with the boom-and-bust cycle. Robert Rendall, Chairman of the Midland Development Corporation, the tax-funded group that’s helping XCOR with more than $10 million, says although the Permian Basin community loves the oil and gas industry, they understand the benefits of diversifying. “We know that sometimes you need something extra to help mellow out those ups and downs when you have commodity price fluctuations,” he says. The MDC is backing the project in the hopes it will create new jobs, bring in tax revenue and bring other space companies to the region. According to Rendall, this is all part of a conscious decision to diversify that the city made a decade ago. He says XCOR might be a long-term investment, but that it’s a smart one. “The people that are involved in commercial aerospace are very much like our wildcatters of West Texas,” he says. UT Permian Basin Economics Professor Scott Carson says he’s heard these promises about a new economic future for the region before. He says in years past the hype was about retail, then healthcare, then there were plans for a multi-million-dollar, job-creating nuclear power plant that was touted as something that would put the region at the forefront of nuclear research. But that plan fizzled, and Carson says this one still could too. Midland’s former mayor Wes Perry was around for the early days of negotiating with XCOR. He says at first he didn’t see why the company would want to move here, and he wasn’t sure they ever actually would, but he says the business-friendly environment in Texas ultimately sealed the deal. XCOR still won’t bring in as many jobs as oil and gas does, but Nelson says the difference with his company is that it’s not tied down by the ups and downs of the energy game. He says he’s “not at all” worried about another bust. Whether or not the private space industry actually re-defines the Basin’s economy like some are promising, the millions of dollars in incentives and the political enthusiasm for this industry in Texas means if XCOR does stick around for the long-haul, it’ll succeed here far faster than it might anywhere else. This entry was posted in KRTS News and tagged Aerospace, Commercial Space Flights, Midland Development Corporation, Midland International Airport, Oil and Gas Industry, Permian Basin Economy, Private Space Industry, science, Space Travel. Bookmark the permalink.